I always love seeing new (to me!) photos of Crabs, and this one is reallly nice. 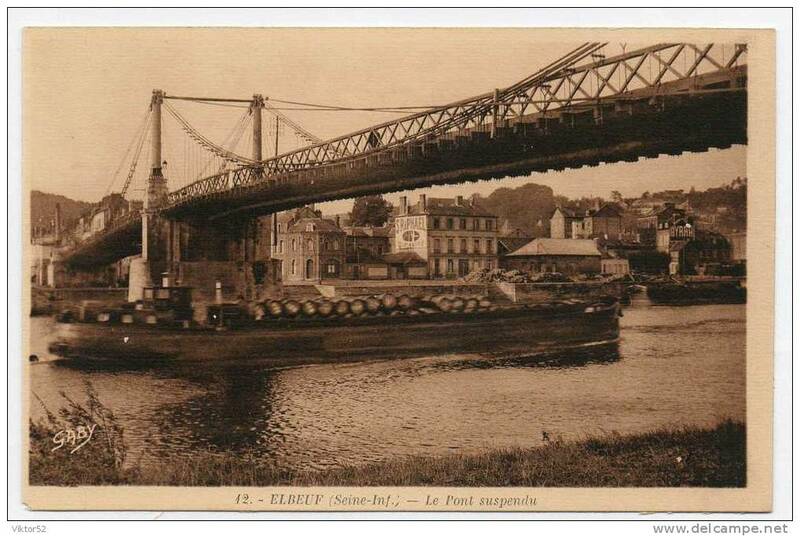 The Sqn crossed the Seine at Elbeuf behind the armd bde, highly organised with marshalling areas etc and the bridge - a Bailey single tier on pontoons - quite easy for us. 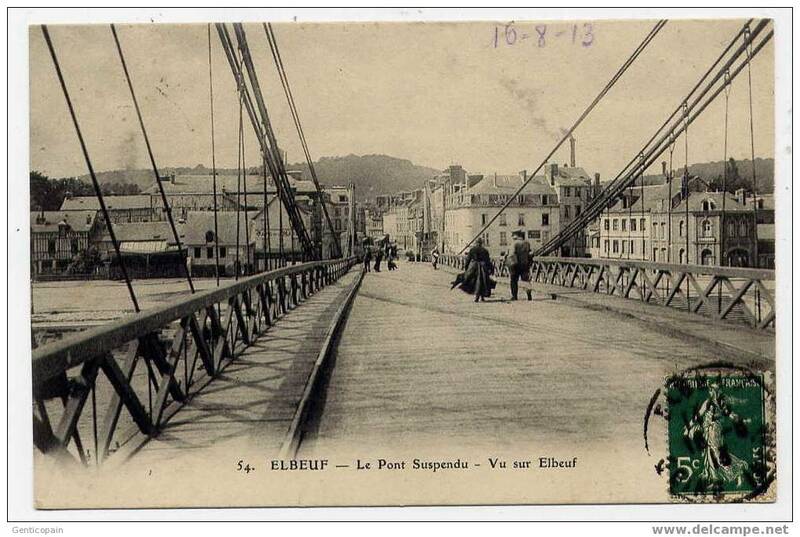 We harboured in the valley on the East bank and were engaged by sporadic mortar and 88mm shellfire, not to forget tempestuous rain." No sign of "tempestuous rain" on the photo (it probably came during the evening), but the description of the bridge certainly fits. 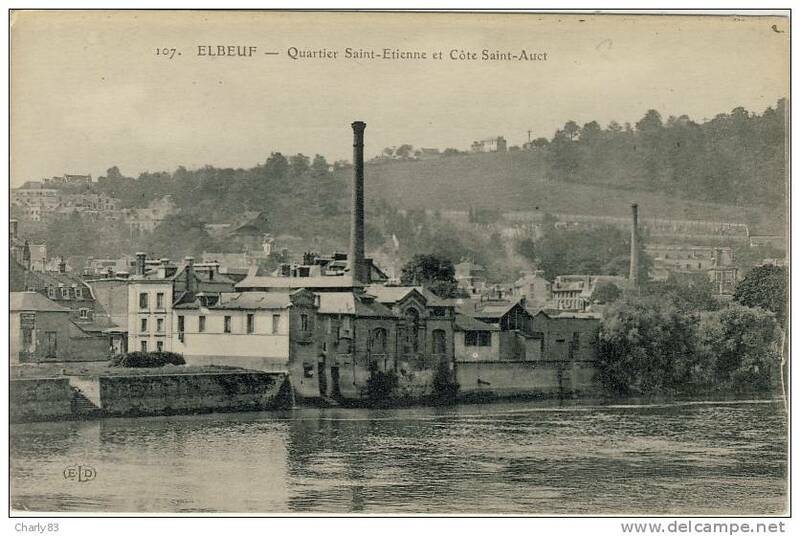 Then I looked up Elbeuf on GoogleEarth, but no luck, nothing recognizable as no old buildings remained. Les, do you have a higher resolution version of your photo, where perhaps we can see the Crabs better? From Report No. 183, "Canadian Participation in the operations in North West Europe, 1944. Part IV: First Canadian Army in the Pursuit (23 Aug - 30 Sep)"
were being ferried over on two Class 40 rafts before nightfall (see pra 79). completed by 8 G.H.Q. Tps R.E. (at 120988) on 30 Aug (Ibid: 30 Aug 44)." PA-137295: "8th G.H.Q. 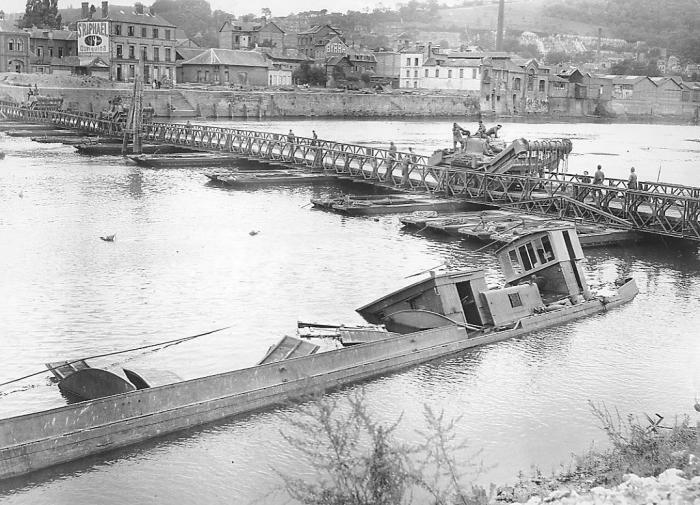 Troops English Engineers assemble floating Bailey Bridge, Elbeuf, France, 27 August 1944." 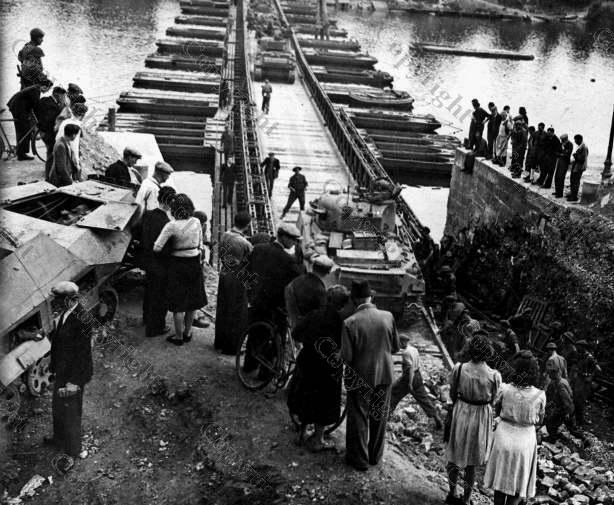 PA-136015, PA-131344: "16th Field Engineers starting to build a Pontoon bridge over the [Seine at Elbeuf, 27 August 1944.]." PA-137296: "A General Motors Staghound T-17E1 armoured car of the 12th Manitoba Dragoons crossing a Bailey bridge, Elbeuf, France, 28 August 1944." PA-113663, PA-113662: "[Vehicles of the 4th Canadian Armoured Division crossing pontoon bridge over the Seine River near Elbeuf, France, 28 August 1944.]." 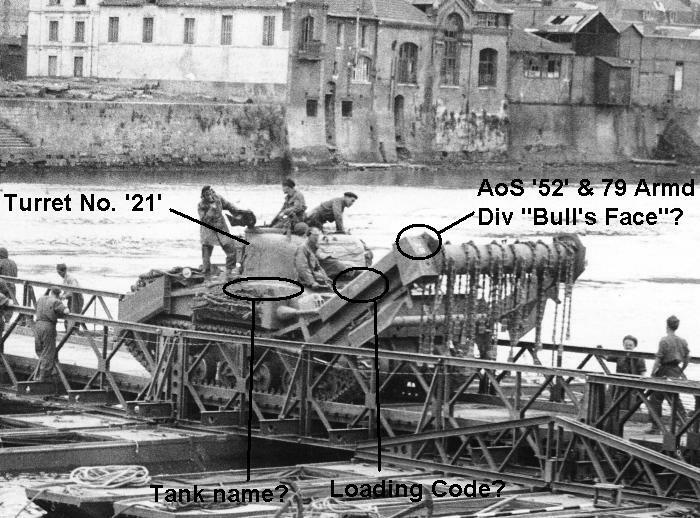 PA-133660: ['Sherman' tank crossing pontoon bridge over the Seine River near Elbeuf, France, 28 August, 1944.]." The link to Juno Beach Centre in the linked post is now also dead, and I could not find the photo in the new website. Source: "No Price Too High: Canadians and the Second World War" by J. T. Copp & Richard Nielsen, page 180. 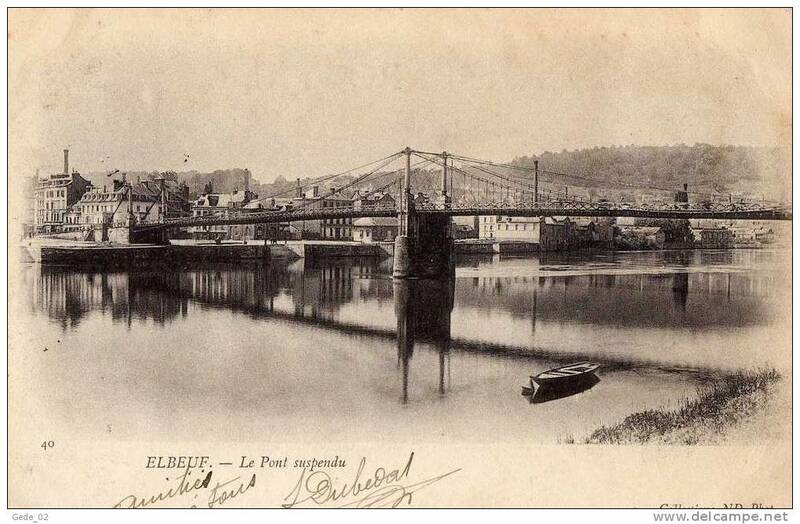 The name of the bridge (GRAY, also visible on one of the photos above) and location are both spelled out in the captions, and there's even a photo of the other bridge at Elbeuf (ROSCOE)! 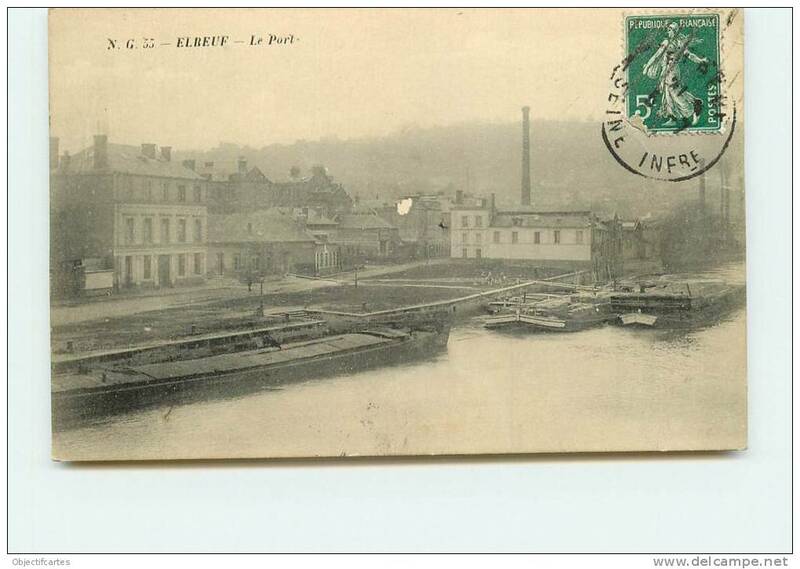 Coy moved to Le Hottelerie along with 90 Field Coy on route for construction of bridges over Seine at Elbeuf. 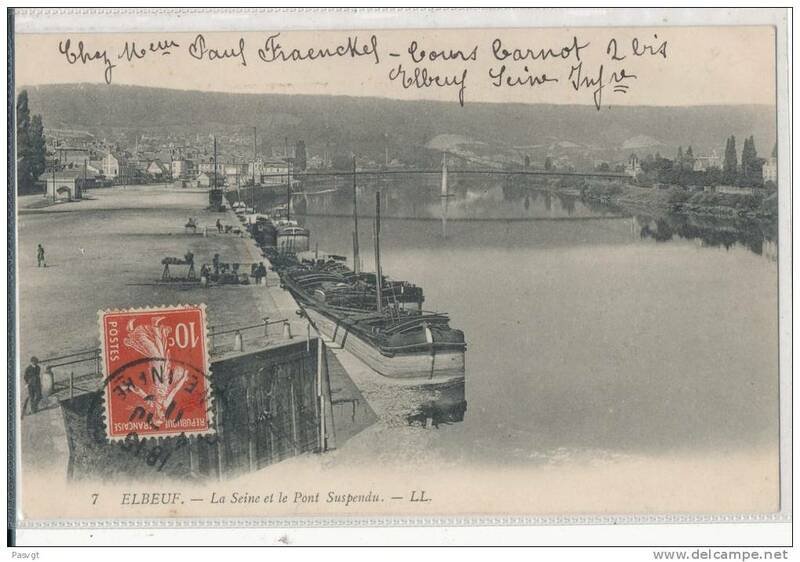 Coy moved to La Haye Malherbe, construction on bridges over Seine at Elbeuf commenced by 8th GHQ Troops. 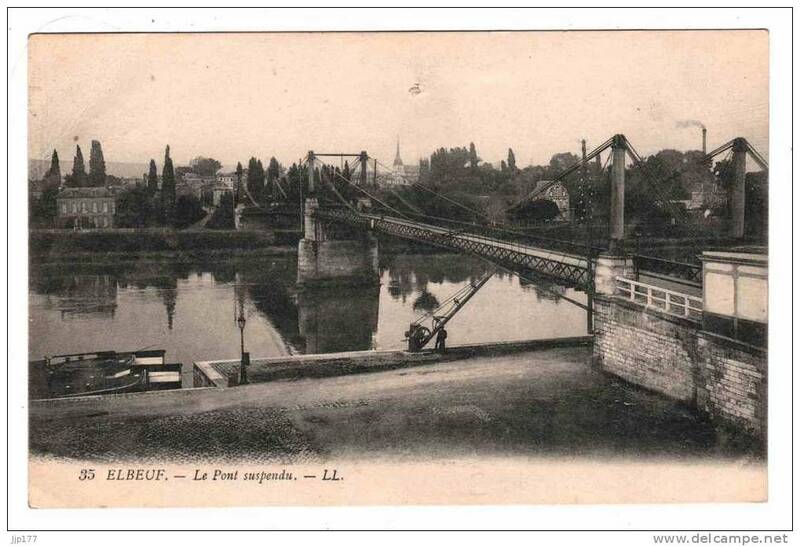 1st bridge completed on 28th August at 02:00 "Gray" Bridge named after A.A. Gray [Maj Andrew Aitken GRAY P/154298, OC 89 Fd Coy RE]. 2nd Bridge "Roscoe" completed 30th August 13:00." Incidentally, I also just found this other ww2talk thread where Les asked the same question and was given the correct location by Mike-Trux over a year ago. Well done Mike! This is a wealth of information, with some magnificent photos. Thank you for taking the trouble to post. Is that one of the four seat Bofors Blitz crossing behind the Jeep?? Sorry, can't help you as I know next to nothing about SP AA . All I can say is that the markings show the 51 (Highland) Div 'HD' emblem, and that the AoS number on the right should read '47', for 40 LAA Regt. Would the deck beams need to be replaced often......??? If the instruction sign for constant first gear speed was respected the CMP vehicle speed must have been about the pace kept by an infantry man ...approx... 3 mph.....????? and slower for a tank..? Thanks a lot for posting this close-up. The turret number '21' is consistent with 'A' Squadron, and would make this tank part of 2 Troop 'A' Sqn 1 Lothians. Maybe the name could be guessed if the original photo is a good print and could be further enlarged ? 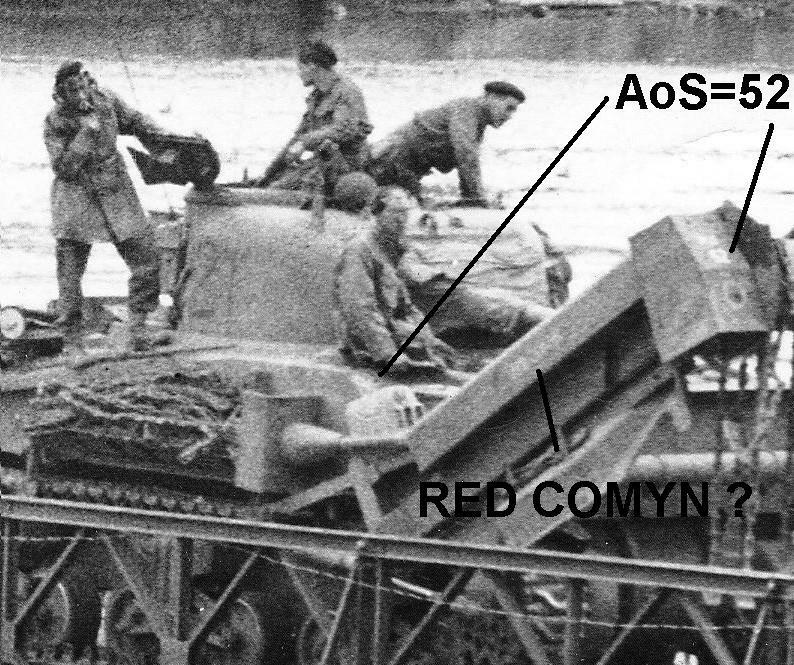 There is however a measure of doubt remaining, as 1 Lothians tank names were normally painted (red with a white shadowing) on the hull sides, but there seems to have been exceptions such as (possibly) 'COEUR DE LION', painted on the flail jibs because the various stowage items would have obscured them if painted on the hull. The Arm of Service number 52 (white over red square) is clearly recognizable on the front of the jib (with the yellow circle of the bridging class below), and can be guessed on its other customary location in 1 Lothians on the top right corner of the hull front plate. Crossing a Bailey bridge with a Crab was visibly a precision job, with a very watchful crew member each side assisting the driver, and the other two guys seemingly enjoying the view but probably ready to jump off any moment! Many thanks for this hi res scan, which brings one more match between tank number and tank name in one of my favourite units! Last edited by MicS; 13-06-14 at 12:17. From the caption it looks like it's part of the Canadian collection. 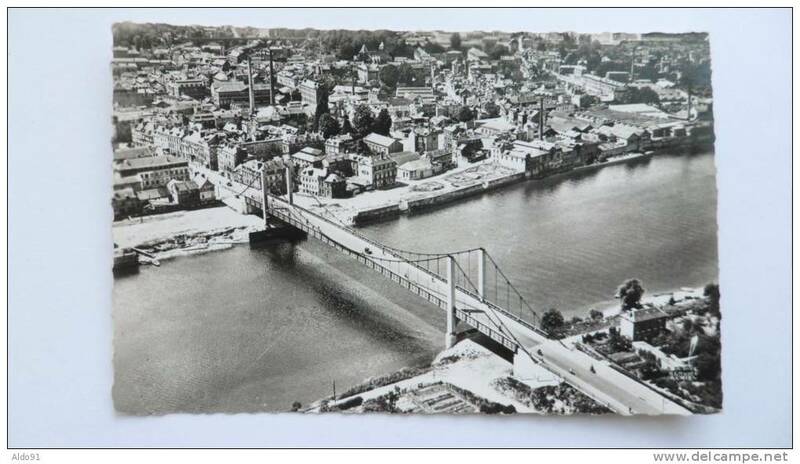 I wonder if the "thing" in the water to the right of the bridge (top right of photo) might be the remnant of one of the destroyed bridge piles? It is visible on some of the other photos as well. Last edited by MicS; 25-08-17 at 08:50. I just got back from driving through NE India. Went up from Imphal to the Burma border. The crossing between India and Burma/Myanmar is a serious Bailey bridge - a triple triple (three wide by three high). Although span has a lot to do with the bridge composition this is not particularly long and I think it could carry just about any modern day heavy truck. I have an original copy of the First Edition of the Sherman Crab Instruction Book - have you seen this? If not, am happy to post some photos from it. Hello everybody! I'm looking for information about Bailey Mk.II bridges, that should mean "original" British materiel and not US M1/M2 types. There is one still "living", in use since the 50s or 60s in my whereabouts in Italy. 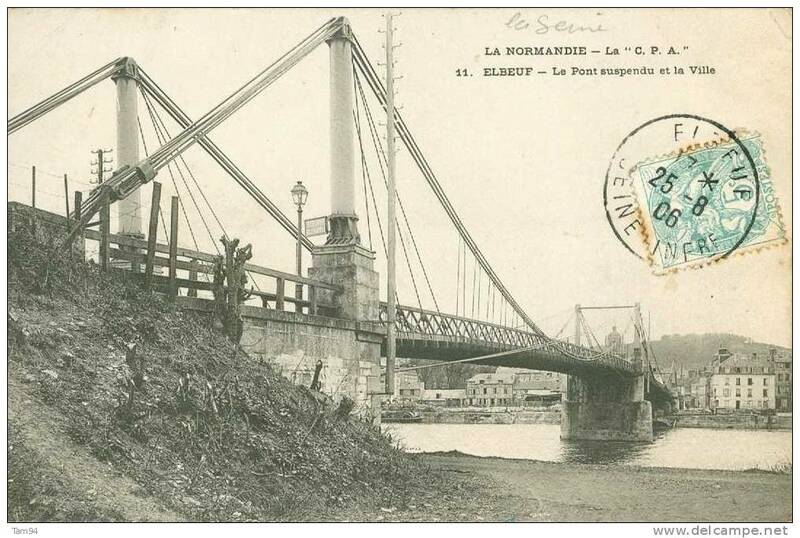 I still have to take measurements and pictures, though I've been driving on this bridge for decades - maybe I always took it for granted as I was used to it since my childhood - but now I want to research its story in depth. At first I thought it was standard US/NATO issue, which was also widely employed by the Italian Army in those years, but the width doesn't seem to fit and the markings on it are clearly British and not US. So maybe it was really "WW2 surplus" when it was fitted, or the Italian Army had manuals describing the M1A/M2 but actually had in use also the British version. Hell no! I'm not that old! Thanks Michel, maybe it's the angle from which the photo was taken but I couldn't work out what it was. The onlookers must be obscuring the front wheel. Last edited by motto; 23-12-13 at 12:31. Ha! I like the contrast: 'Friendship Road' ... and a guy with an auto slung over his shoulder! The Triple Triple (TT) had a curious way of construction: build a Triple Double (TD), launch it in to place, then add the third layer of panels, starting from both sides, in equal steps. The last step is to add the top cross braces, from the bridge span's centre and working in equal steps outwards in each direction. The other curious thing about the TT bridge is that it requires only a TD at each bridge end panel, rather than the TT as shown here. The man at the controls of the crane is my Dad, SPR Soli Dubash. D-127262. 1944 pam, if you ever want to put one up. The turret number '21' is consistent with 'A' Squadron, and would make this tank part of 2 Troop 'A' Sqn 1 Lothians. The link you provided above is dead, but possibly it pointed to the attached picture of Sherman Crab T-212645 RHODERICK DHU after it met its demise at Westkapelle, The Netherlands, during Operation Infatuate II in November 1944. I've updated the link in the referred post. And thank you for your in-depth analysis and documentation! I have taken the liberty to celan up some of your postings by adding the pictures as attachments, plus links to their sources. That way, the pictures are in a format which fits the screen, and will alway stay within the respective thread, even if the photobank or photo hosting service changes their policy. While the public photobanks may change their interfaces, I am more concerned by the private photo hosting companies changing their policies - like Photobucket recently did. So please attach your photos to your posts as described here. Thanks for adding my pics as attachments. The reason I used external photo hosting is that sometimes a forum software changes and (at least some of) the photos get lost along the way. This happened to me on Missing Lynx looong ago and on ww2talk recently . Another is that (I think?) one has to be a member to see the attchments, and I felt that this condition might reduce the visibility of the photos and therefore the probability of someone with some relevant info to see them and join in. But as you rightly pointed out, the Photobucket Massacre shows that this is not a perfect solution either (I did leave them long ago, so fortunately was not affected apart maybe from some very old posts which I may have forgotten about), so I would think that with both options we run less risks of losing the photos altogether. Indeed I edited your posts to include both a local attachment plus a link to the photo hosting site, or the online source photo bank. Best of both worlds I think? Anyway, I came across your name on several forums in relation to Sherman Crabs and the 1st Lothian and Border Horse Yeomanry. I am doing some research into the Shermans used in Infatuate II. I'll start a new thread and would like to ask you to chime in if you can. Yes, that's what I meant by "with both options". Thanks again. I am doing some research into the Shermans used in Infatuate II. I'll start a new thread and would like to ask you to chime in if you can. Please do, I'll be happy to contribute if I can, starting with a first (and somewhat pedantic) remark: the first battalion was "1st Lothians and Border Yeomanry", no "Horse" here, which went to the 2nd battalion: "2nd Lothians and Border Horse" . But you are still correct in that the regiment was indeed "The Lothians and Border Horse Yeomanry"
Last edited by MicS; 26-08-17 at 17:08. Thanks for that remark. Not pedantic, we must get the facts right. Please see my thread Operation Infatuate II: Sherman tanks at Westkapelle. If you have anything to add and or correct, please do!